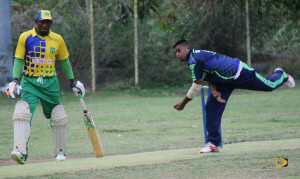 during their BVI Cricket Association Twenty 20 encounter in Greenland on Sunday. It was Vincy’s second defeat of the season, this time by 37 runs and puts them on the verge of demotion to Division I as they face Grenada, both 1-3 on Sunday afternoon. Chasing unbeaten Cavaliers’ 198, constructed in part with 51 from Mohammed Hassan and a supporting 36 from Drumor Tooney after inviting them to bat, Vincy raced to 67 for 2, was on pace with Cavaliers who were at 72 for 2 at the same point in the game. That’s when Duggin and Sukdeo “Vin” Rambarose began ripping through Vincy’s order, combining to bag six wickets for 22 runs including a spell of 5 runs for 5 wickets. Duggin plucked 3 for 1 in the ninth over, as the defending champs slumped to 89 for 7. Vincy’s carnage began after Sheldon John added 17 runs before he was caught at backward square for 31 for the third wicket and the score on 84 for 3. Three runs later, opener Stephen Liburd went for 33. Two of the next three batsmen including captain Brent DeFreitas went for ducks, before Neil Niles injected some life with his patient 45 not out after batting for 51 minutes. Vincy were bowled out for 161 in 19.2 overs when Earl Prescott was caught out by Jagnarine Persaud at cover. At 1-2 and facing the possibility of demotion to Division I, Vincy will face Grenada also 1-2 in a crucial Sunday afternoon encounter, starting at 2:30 p.m. In the Division I match, Sam Malpass had a knock of 105 not out with a supporting 58 not out from Deko Khemraj and a contributing 53 from Kemino Alphonso, that helped the Vikings to a 230 run victory over BVI Academy, after posting 288 for 5. BVI Academy were bowled out for a paltry 58 in 15.4 overs.